During last week's GOP debate New Jersey Governor Chris Christie called Marco Rubio out for continually repeating the same scripted lines in his answers during the debate. The exchange between the two led to many of Trump's supporters to calling Rubio "robotic." I guess Chris Christie was afraid to attack Donald for being the same as Rubio. If anyone should be accused of being "robotic" in their delivery, it is Donald Trump. Below is a video I made in December from Donald Trump's announcement speech from June 16th of 2015. Not one clip was used twice. You can view the above speech in it's entirety HERE but, I don't know why anyone on earth would do that. 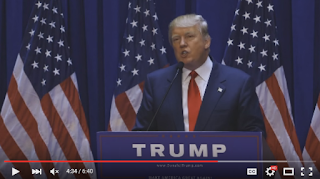 Watch the 6-minute and 40-second "Repeater-In-Chief" video I posted above. It will make much more sense to you than the entire 51-minute speech.